Ok, I couldn’t finish by one post about my Lunar New Year’s foods!!! Witch is right side one in the picture. 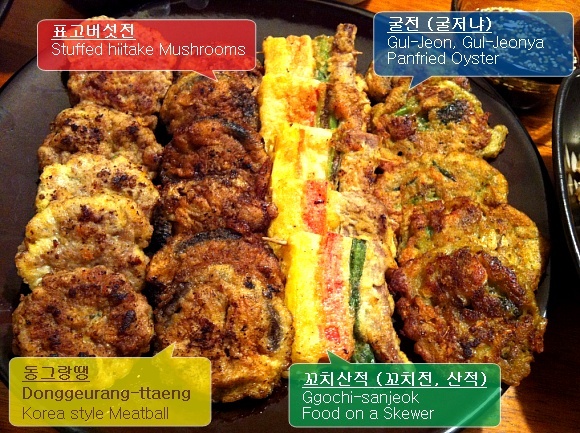 Ggochi mean is skewer, Sanjeok mean is any kinds of food you cut into long strips and line on a skewer. Normally my family use tooth picks, because it’s perfect size for it. And I skewered danmuji (Koean Pickled Radish), imitation crap meat, green onion and thin cut sirloin. 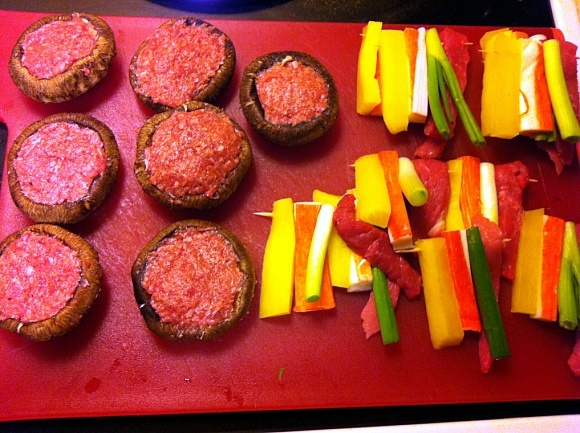 You can use pretty much any kinds of food that you can cut into a long strips and can skewer. I took out of the steams, chopped fine pieces and set a side. Because I used for my Gul-Jeonya (Pan-fried oysters). Anyway, and then make the stuffing. Take the steams out from the mushrooms. In a medium mixing bowl, combine all together and mix well. In a small bowl, pour 1/3 cup of flour. In another small bowl crack an egg and beat well. Coat the stuffed mushrooms with flour, shake off the excess flour. Place on heated and oiled pan, cook 5 minutes both side, until golden brown and cooked though. Drain excess grease on paper towel, serve warm. Basically all the Jeons are same cooking method. Dust with flour, coat with beaten egg and then pan-fry. I did exactly same steps to my Ggochi-Sanjeok. I could done the pan-fried oysters in the same method but I decided little different and easy way. in a medium bowl, whisk first 7 ingredients until combined. Add green onion and mushroom mix it well. Heat a large skillet over medium-high heat; add oil until it coats the pan fully. When the oil got hot, place 1 heaping Tablespoon of the oyster mixture on to the skillet. Cook 2 minutes each side, until golden brown and cooked through. Repeat the method until it’s done. 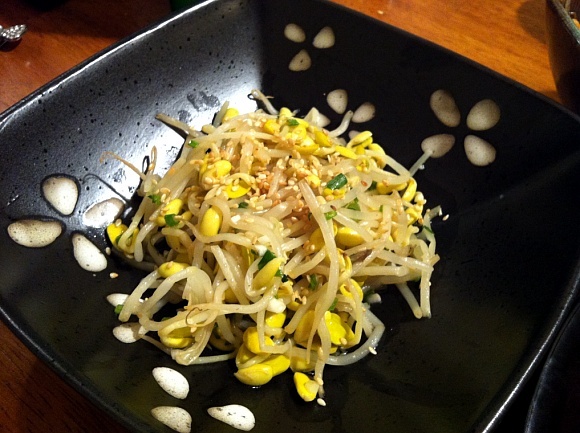 I made soy bean sprouts side dish! And I made spicy radish side dish too! 무생채!! 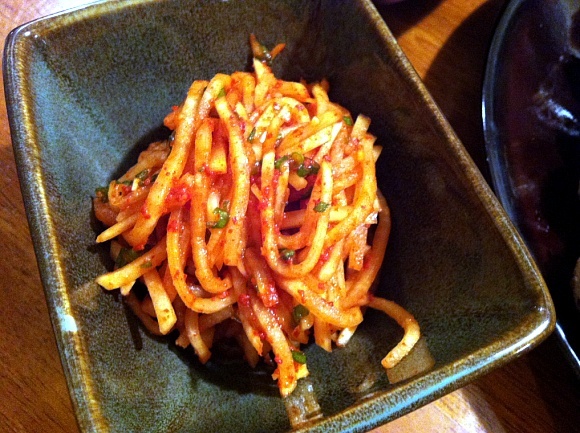 It looks similar to kimchi but tastes different. Here is my mother’s recipe for it! In a large mixing bowl, combine all of the ingredients and mix well with your hand. Next year I will come with other Lunar New Year’s food that I couldn’t show you this year!! 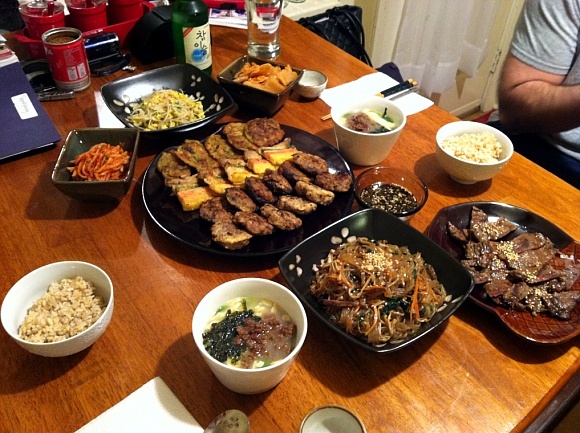 Oh, don’t forget Soju while you’re eating Korean’s Lunar New Year’s food!!!! Simple Salad with Teriyaki Chicken! I like the look of the Korean style meatballs. Wow! this post is about 5 years ago, and I’ve never thought update these recipes…Thank you for requesting, since lunar new year is right around the corner, I will try to push these recipes into my schedule.. hopefully I can make it in time, since this month filming schedule is filled…! Wish me luck! !